Objective Determining the prevalence of depression and comparing sociodemographic, metabolic and clinical indicators in depressed and non depressed people suffering from type 2 diabetes. 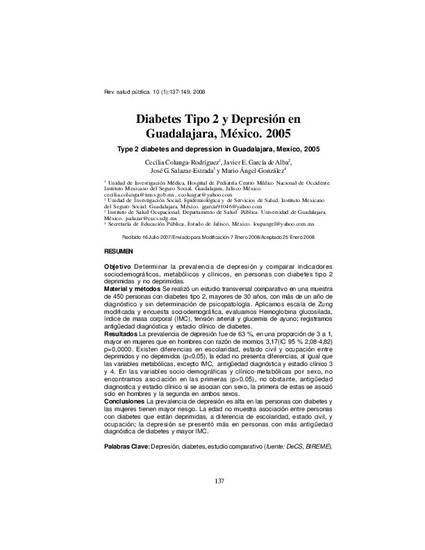 Methods A comparative cross-sectional study was carried out on a sample of 450 people aged over 30 suffering from type 2 diabetes; they had been diagnosed more than one year before and psychopathology had not been determined for them. A modified Zung's scale was applied and a sociodemographic survey carried out. Glucosylated haemoglobin, body mass index (BMI), blood pressure and glycemia in fasting were all evaluated. Diagnostic history and clinical state regarding diabetes were recorded. Results There was 63 % depression prevalence in a 3 to 1 ratio, this being greater in women than in men (2,08-4,82 95 %CI, p=0.00). Differences between depressed and non-depressed people were found in schooling, civil state and occupation (p<0.05); differences were not presented with age, just like metabolic variables, except for IMC, diagnostic history and clinical states 3 and 4. No association was found between socio-demographic and clinical metabolic variables by gender (p>0.05); however, diagnostic history and clinical state were associated with gender, the former being associated just with men and the latter with both sexes. Conclusions The prevalence of depression was high in people suffering from diabetes and women were at greater risk. No association was revealed between age and people suffering from diabetes who were depressed, unlike schooling, civil state and occupation; depression was presented more amongst people having a longer diagnostic history of diabetes and greater BMI.